You can’t build a trail with your bare hands alone. Whether you are building a trail for mountain biking, hiking, or horseback riding, you will find at least some of these tools necessary for getting the job done. Chainsaw: I believe we are all familiar with the chainsaw. If you are building trail through forest and trees, one of these machines will save you the most work of any tool in this list. There are other ways of cutting through heavy dead-fall and brush, but the advantages of using a chainsaw are tough to deny. Keep in mind safety first when using one of these obnoxious things, and always wear the proper protective gear. If you plan on falling trees, please get yourself the proper training. Brush Saw: Like the chainsaw, the brush saw is a gasoline powered machine used to cut through light-to-medium thick brush. 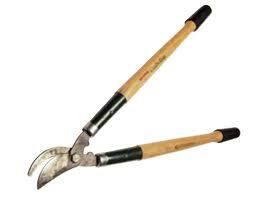 If you haven’t seen one of these tools before, just picture your common home and garden weed wacker on steroids! It has a long motorized shaft with a round saw blade at the end of it, along with a shoulder harness and two handles to control it with. One of these puppies will mow down a lot of brush in a short while, and rivals the chainsaw in time and energy savings. 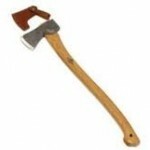 It is also probably the most dangerous tool to work around, as it can chuck wood and debris a hundred feet or more. Give somebody operating a brush saw plenty of space. 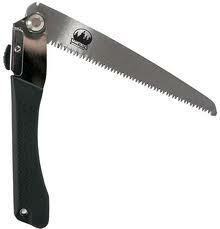 Folding Saw: I don’t go anywhere without my little folding brush saw. When I am bike riding, it is in my pack in case any thing needs sawing. When out in the woods building trail, it is always in my pocket ready to be drawn in a flash. Never underestimate what a high quality folding saw will cut through. 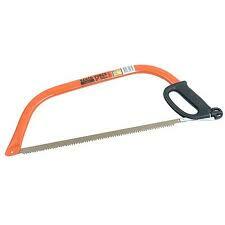 Bow Saw: A bow saw is super handy for cutting logs across a trail and clearing brush. 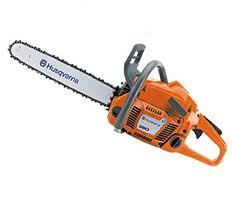 Great for use instead of chainsaws and brush saws, both of which, despite being fast, are bulky, heavy, and noisy. 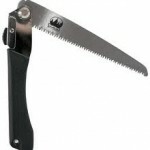 Short saws 16 to 2 1 inch blades are easy to strap to pack and work great at clearing small and medium brush. 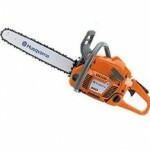 Longer ones with 24 inch blades or longer are capable of ripping through thick logs and trees. The blades cannot be sharpened, but all of them can be easily replaced. Tip: Treat the blade with some WD-40 every once in a while to keep it sharp and free of rust. Pole Saw: Sometimes you need to clear tree limbs that are hanging down too low and covering the trail. Usually we are capable of getting at all the limbs we need to using our folding saw, but this usually means standing under them and raining down saw dust into our eyes. If the limbs are really big, it may be too dangerous to stand under them at all. 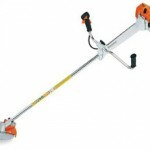 A pole saw with a telescopic pole is a great tool for getting at overhead branches cleanly and safely. Pulaski: If you aren’t new to trail building, than you are probably not new to the Pulaski either. 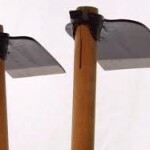 This familiar tool with an axe blade on one side, and an adze or grub hoe on the other, is probably one of the most versatile tools in our arsenal. 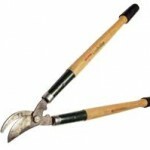 It is great for breaking dirt, cutting roots and stumps, cutting logs, and carving out fine trail features. If you use it in a rocky area, you will quickly dull the edges, so in hard terrain it is best to drop it and pick up a pick axe. Keep a file in your pack to refresh the edges once in a while. Note: Be careful not to smash the handle of your Pulaski on rocks and stuff. The handles on these tools are not very robust, and seem to break a lot easier than some of the other grubbing tools in this list. The heads also seem to come loose on them, so it is best to be extra cautious of your swing, and where others around you are standing. I have seen a few of these axe heads just fly off the handle. You don’t want to be in the line of fire when one lets go! 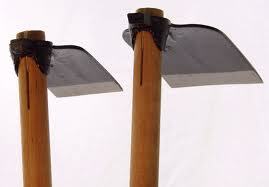 Pick Axe / Mattock: One of the main work horses of the trail builder is a pick axe. 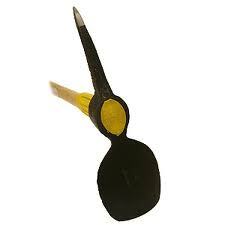 They come in many different varieties, with a selection of pick shapes and widths to choose from. If you are working in soft soil, on of the best I have found is one that has a fine pick on one end, and a large, 8 inch deep scoop on the other. With one of these, hard ground can be loosened up with the pick end if need be, and major earth can be moved with the scooped end. 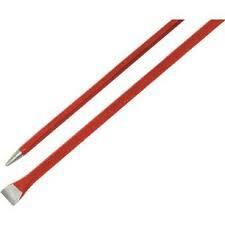 I be lieve they are called a clay pick. One of the nice features of the clay pick is that the handle has a rough textured paint on the end of it so that you can still keep a grip on it even if your gloves and the tool are completely covered in muck. If the ground you are working on is really rocky, you may get more use out of a pick with a narrower blade for max ground penetrating power. Macleod: Of all the tools in this list, the most popular one with us has got to be the Macleod. It just screams “Trail Building!” While all the other tools have many common uses outside of the realm of bike trail building, the Macleod, or mountain rake, really isn’t seen any where else but trail building (with the exception, maybe, of forest fire fighting.) This tool is the holy grail of trail building tools. A lot of work can be done with it alone, but where it really shines is in the details. This is usually going to be the last tool to touch a trail tread before opening it to riding. 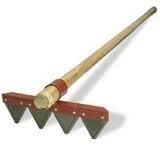 The Macleod is basically a sturdy rake with a long handle and a wide square edged hoe on the opposite side. It is good at scraping, cutting small roots, and removing rocks from the trail surface. For finishing, its wide, flat hea d is ideal for packing the trail surface, and leaving a product behind that is ready to ride. A must have tool for any trail crew. It is not a tool you will commonly see in the hardware store, but most stores are able to order them in for you if you request one. Bring a picture in case they have no idea what you are talking about! 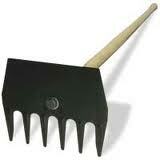 Fire Rake: The fire rake has a few sharp triangular teeth on it, and a long handle. They are useful for clearing the trail of small brush, grasses and weeds. Although it is not as versatile as the Macleod, it is lighter, and therefore easier to carry around. 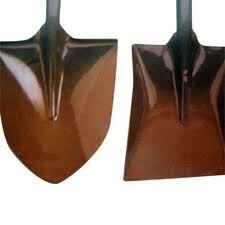 Shovel: Sometimes we need a good ol’ fashioned shovel. They move dirt quickly for building jumps, landings, and berms. 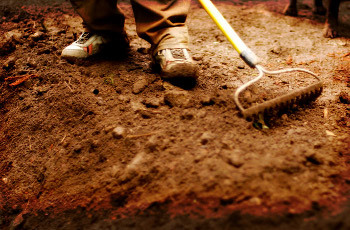 Use a spade for digging and cleaning up the edges of the trail. Use a square, flat shovel for packing jumps and landings and shaping lips. A tree planting shovel is useful for digging post holes and it’s small and easy to carry and swing. Weed Whip: Weed whips are cutting edges mounted perpendicular to long wooden handles and they are used for cutting small weeds and brush close to the ground. They will do some of the work that a gasoline powered brush saw can do, but are much lighter and safer to use. Their are a couple different varieties that I have seen, but both are similar in use and performance, if I had to choose a favorite, it would be the triangular shaped one over the L-shaped. 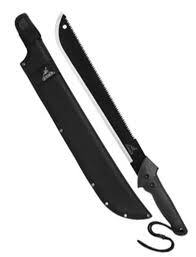 Machete: Machetes are awesome! They are one of the best ways for clearing brush up to an inch thick, and are fun to use. If you keep it sharp, and perfect your swing, you will have no problem hacking your way through thick brush. I use one all the time to open up the sight line as much as I can while walking and flagging trail. They are easy to carry as they don’t take up a lot of space and weigh less than some of the other brushing tools on this list. Sandvik: The next step up from the machete, when it comes to clearing brush by hand, is the Sandvik brush axe. 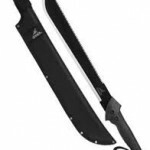 They have a short, thick, sharp, replaceable blade mounted on a longer (24″) handle. They are a bit steadier in the hand than a machete, so are probably safer to use, and you can put a bit more power behind your swing with the longer handle. Rock Bar: A rock bar is just a heavy steel pry bar. 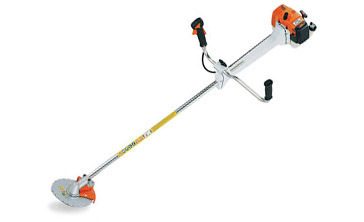 Use one of these to pry out big rocks, logs and stumps from the ground. One of these bars is very heavy, but they are strong and are worth their weight in pick handles! 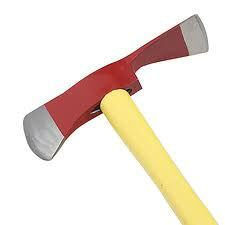 Don’t use your pick axe or Pulaski to pry things as you will surely break their handles. Use a rock bar instead. Rock bars can also be used for digging post holes or breaking apart rocks that have opened up cracks. A very primitive tool indeed, but it gets the job done. 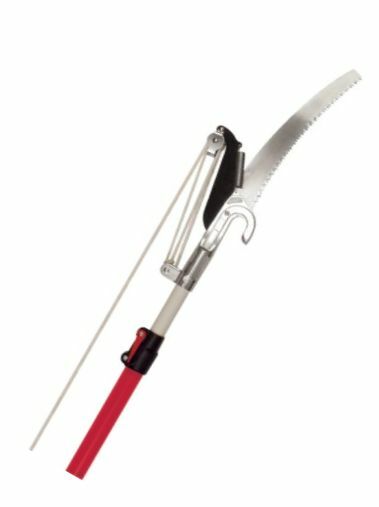 Pruning Shears: Although they will probably not have much use in the initial clearing of a trail, for later trail maintenance, pruning shears are a good tool for lopping of branches and brush growing in over the trail from the sides. They are quicker than sawing, and are gentler to use than a machete or Sandvik. I wouldn’t give them a high rating on the scale of trail building worthiness, but, none the less, some people still really like to use them. Star Drill: Star drills are used for breaking up rocks. They are hammered into rocks to open up seems and cracks. I hope you never need to use one, because it is a very slow process building trails through rock outcroppings. That said, there is nothing more impressive than seeing a trail cut through rock! All the hard work is instantly recognized by every rider who has ever picked up a tool at least once in there life. Tip: It may take a long time to build a trail through a rock slab, but it can be done! If you find yourself with this particular challenge on a trail, don’t be afraid. Assuming you will not be using dynamite to blast through the slab, the best thing is to punch as many holes in the rock as you can, and then sit back and let mother nature do some work for you. Thawing and freezing cycles can help break the rock apart. I have seen this method work well where I live, but it obviously depends on the type of rock you are working with, and the climate in your area. You just have to be patient. Keep breaking and putting holes in the rock, and every spring you will be able to make the trail a little wider. 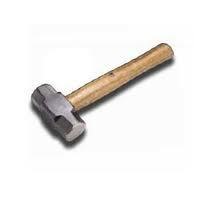 Sledge Hammer: A hammer is required to use a star drill. They are also needed if you are building any wooden structures on your trail, such as ladders, ramps, and bridges. Pounding stakes and posts into the earth is also sometimes necessary. A short handle with a 5 pound head is usually the most you will need and can fit in a back pack comfortably. If you are using a hammer to break rock, wear eye protection. It is also wise to bring some knee/shin guards with you to save your legs from the chunks of rock shrapnel flying into them. 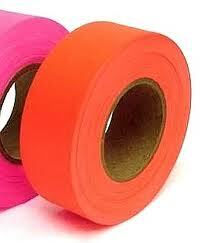 Flagging Tape: Flagging ribbon is probably the first thing you used in construction of your new trail. Flagging the trail is important, and you want to be sure that you never run out of the stuff while you are out there. You can get many bright colors, but some will be better than others. I made the mistake once of flagging a trail in the fall with neon green flagging tape, only to return in the spring and have my tape line completely hid den by the fresh green leaves! That was dumb, but I didn’t think about it at the time. 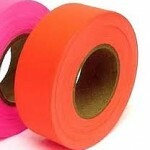 The best color to use, by far, is bright pink. Nothing in nature is that color! Orange and red have a tendency to disappear in a deciduous forest in the autumn, and blue and purple don’t stand out in the shade. 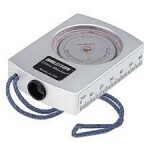 Clinometer: A clinometer is a tool used to determine the steepness between two points. It measures the grade in percent, which is the way engineers measure slopes in road and railway construction. Trail grade is an important factor to consider in building any trail to be long lasting and sustainable. Some people swear that nobody should ever eye-ball grades, but depending on your experience and sensitivity to the landscape, it is my opinion that grade can be adequately estimated without using a clinometer. However, the International Mountain Bike Association itself, the authority on mountain bike trail building, counts the clinometer an essential tool for trail building. I just can’t judge from experience, as I have never used one myself, or even seen one in person. Come Along: A Come Along is a ratchet style cable winch used for pulling large, heavy objects such as rocks and logs. One end is anchored to a tree or other unmovable object, and the the other end of the cable hooked around the object you are moving. The mechanical advantage a come along gives you will allow you to pull up big stumps, move rocks and logs, and place them anywhere on the trail you like. Be creative, and you will find several good uses for a winch. 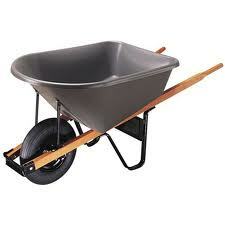 Wheel Barrow: For moving dirt and rocks you can’t beat a good wheel barrow. Dirt Bags: Wheel barrows are rather big things to walk miles into the bush with, and since many of us probably prefer to bike to work on our trail (its more fun if you can be the first to test ride your new section of trail) a wheel barrow is impossible to ride with. If a wheel barrow is not easily available, or is just too much to carry in with you, consider finding yourself some dirt bags. No, I don’t mean your riding buddies! 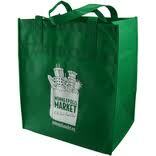 (though they could come in handy as well) but so me bags for carrying dirt in. Bags that work really well for this purpose are the reusable cloth grocery bags that most stores are giving away these days to save the planet. Bring at least two of them, as it is easier to carry a balanced load in each hand. These make carrying moderate amounts of material much easier, and they don’t take up very much room in your pack. 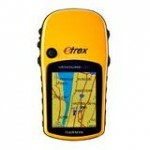 GPS: a GPS receiver is about the least important tool on this list as far as the actual building of a trail is concerned, but it does do a lot of work for you in other areas. Not very many people have the skills to survey a plot of land and superimpose it onto a map, but anyone can make a GPS enabled device and Google Earth do that work for them. 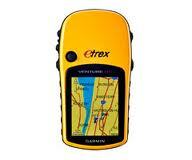 Technology is a remarkable thing, and mapping out a trail has never been easier! As equally useful for creating trail proposals to submit to the relevant land managers before trail building has begun, as it is for mapping out and measuring the distances and elevation of the trail after work has completed. Bonus: You won’t get lost out in the woods by yourself. I don’t think that you will need every tool in this list to build your own bike trail, but hopefully it will help you decide what tools you should start with. Every landscape is different, so what works for me where I live may not necessarily be what will work for you. Your local bike clubs and trail stewards will have plenty of knowledge about your area, so pick their brains. If you are applying for your trail and approaching it properly from a “legal” perspective, than you can expect a lot of help from your local club, including tool supplies. If, however, you are building an “illegal” trail, then you are on your own! Thanks for checking out this post, I would like to welcome everyone to share some comments. Perhaps share with us some other great tools that may have been missed on this list, or simply tell us about the tools you use and why. More about building mountain bike trails. 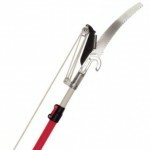 Take a look at JRFireTools website. These tools have been revamped from the ground up. Powerful tools for moving large amounts of material and chopping brush. If you have a wide enough trail, you can use a cargo trailer on bicycle to pull in/out dirt and rocks, mile markers, shovels, etc. It should be evident to all, building trails on public or private property or without permission is a big no no, which may have big legal implications if you get caught. It is also the cause of many trail closures. These land managers and property owners are not easy to work with after this has been done and may never allow a trail to be built on that land again. Most land agencies have a strict policy of not adopting illegal trails. They feel it encourages illegal trail building, a bit like paying ransom, it just lead to more not less. Building with permission takes time planning and a lot of patients but leads to trails that will be around for a very long time to enjoy. Check with your local mountain bike clubs, they usually have legitimate trail building efforts ongoing and you can get your trail building fix without getting into a mess. efficiently. There is considerable expense involved with installing a septic tank. * Edwin Hubbel Chapin once said, “Every action of our lives touches on. These microbes will settle in the tank and digest the waste in the tank. looking for cheap plastic arrow signs ? //www.theslammertool.com makes all kind of tools that use a stronger connection than conventional tools listed above. They made us a maddock/ fire rake and it is awesome! Thank you for some other informative website. The place else may just I am getting that kind of info written in such a perfect way? I have a undertaking that I’m just now operating on, and I’ve been at the look out for such info. Prezado fit burn acabou de chegar, chegou vário rapido, prosseguirei estrear atualmente mesmo, para eu tiver meus resultados, postarei mais uma vez. with your RSS. I don?t know why I am unable to subscribe to it. Nice write up! I carved a trail through some woods and thickets near my land a few summers ago, my kids and dogs love to run around the loop now! Luckily, I did not have to clear much land so I only needed a machete, shovel and some pruning shears to get the job done! I do not think I would be able to carve a trail through rock using a star drill! I find this article is so much information. 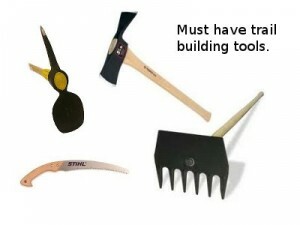 You give all the detail of tools For Trail Building. I like you article. Thanks for sharing. Thanks for sharing, all great tools for trails and possible for your garden too. Pulaski.I think everyone should have this toot.You don’t even think how these multipurpose tools help your work.The power tool btw it’s a nice listing, Thank you very much for sharing.